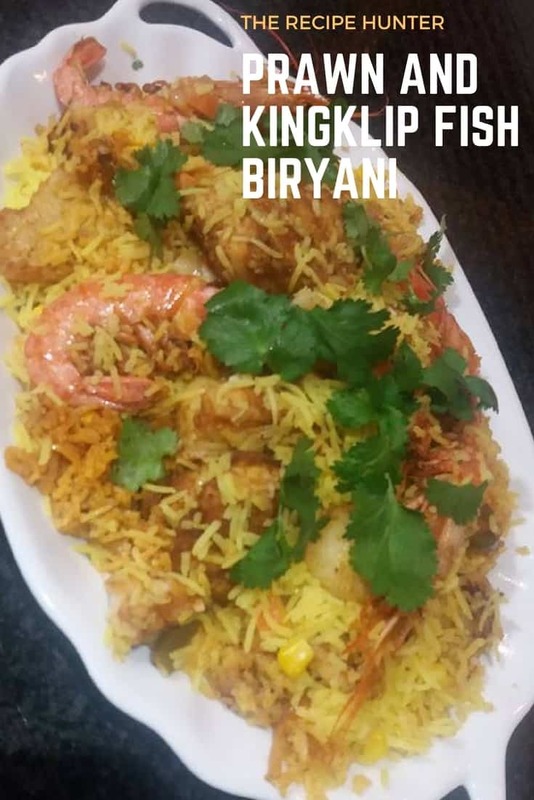 How to Make Fish Biryani. Boil 3 cups long grain Basmati rice in salted water with one cup Mcain Mixed veggies and 2 teaspoons fine rice spice until cooked. Strain in rice colander and set aside. Spice fish and prawns or fish of your choice with aromat, fish spice and Fisherman seasoning. Fry in shallow oil and set aside. Slice 3 onions thinly and braise in oil. Add one large sliced green pepper.Take out half of onion and green pepper. add salt to taste. Set aside and mix with the cooked rice. 1 teaspoon Rajah mild and flavorful spice. Add half cup water and simmer for 5 minutes. You can add more water if needed to make it saucy. Fry potatoes, cut in rings until crispy. set aside. Add fish, prawns and fried potatoes slices and pour the curry sauce over. Add pieces butter on top and put greased paper on and seal with lid and simmer on low heat until butter is melted.